As a clinician who specializes in helping people with chronic digestive complaints and auto-immune diseases, one of the most common underlying problems I see with these individuals is low stomach acid. This syndrome is also called hypochlorhydria in the medical literature and it is immensely important to correct first in order to get someone well. Unfortunately, the mainstream medical system is almost completely unaware of this issue and actually does things, such as prescribing anti-biotics, NSAIDs and acid blocking medications that only make it worse. Most natural health practitioners are either not addressing this issue or they often think very lightly about it. Stomach acid is also called hydrochloric acid due to its chemical structure of one hydrogen ion combined to one chlorine ion making HCL. It is responsible for sterilizing any food wishing to make it into your gut and breaking down protein. 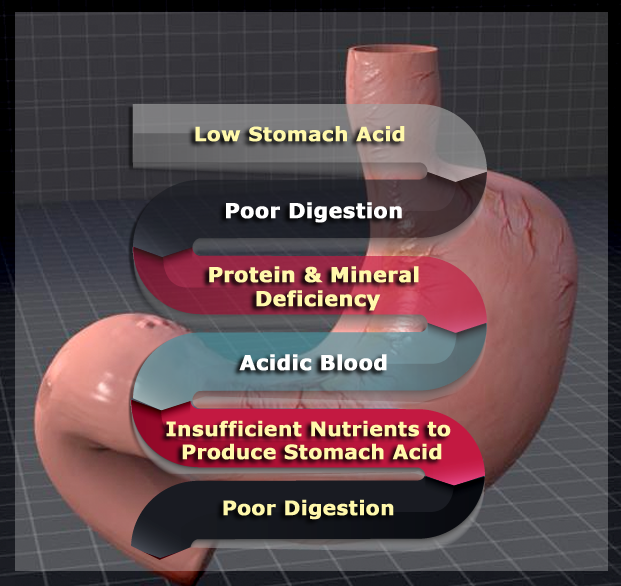 Low stomach acid creates a vicious cycle of poor digestion, chronic gut inflammation, microbial overgrowth, leaky gut, elevated stress hormones and lowered nutrient absorption (1). The only things that will break this loop are to reduce stress in all its forms and support adequate stomach acid production. The symptoms of low stomach acid are too many to count, but here are some of the major ones that I commonly see. 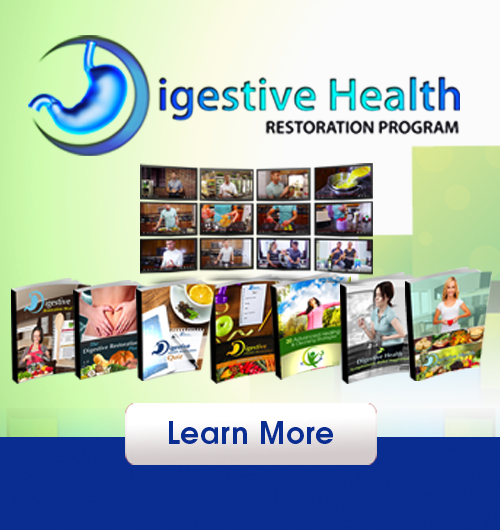 There are a number of things that can lead to chronically low stomach acid production. Anything that is causing a chronic stress in our body from poor diet, bad relationships, bad posture and subluxation in our spine, constant worry and fear and overuse of medications. 1) OverUse of Anti-Biotics: Anti-biotics transform your microbiome and cause an increase in intestinal related inflammation in the body. This inflammation causes a rise in stress hormones which reduce the bodies ability to produce HCL. 2) H Pylori Infection: H Pylori is a common part of our microbiome, however, with the overuse of anti-biotics, chronic stress, poor diet, etc. we can cause a shift in the microbiome, a lowering of stomach acid and the overgrowth of H Pylori. As H Pylori overgrowth occurs, these little guys produce an enzyme called “urease” which breaks down the urea in the stomach into carbon dioxide and ammonia. This causes belching and halitosis (bad breath) for the individual and it neutralizes the acidifying effects of hydrochloric acid allowing for further growth of H Pylori and more stress on the GI system (2). 3) Chronic Stress: Chronic stress impairs the digestive systems ability to produce HCL and other digestive juices. Our autonomic nervous system is composed of 2 main branches. The sympathetic and parasympathetic branches. Proper digestion depends upon us being in a parasympathetic dominant state. Chronic stress puts us in a sympathetic dominant state which restricts activity in the digestive tract and causes poor digestive function. 4) Poor Diet: A diet rich in processed foods, sugars, grains, etc change our microbiome and cause chronic inflammation and elevated stress hormone production. Blood sugar stabilization is very important for normalizing stress hormones. Stay on a lower carbohydrate, higher fat, anti-oxidant rich diet and your stomach acid levels will improve. 5) Eating Too Quickly or on the Go: This is one of the BIGGEST PROBLEMS we have in our society. We eat a lot of food quickly and often throughout the day. It is critically important to be sure to never eat when we are in sympathetic (fight or flight) mode and to take time to relax, breathe deeply and increase parasympathetic activity. You should feel relaxed at least 15 minutes before eating and up until 1-2 hours after finishing your meal. 6) Overuse of NSAIDs: In our society, we pop Tylenol, aspirin, aleve and ibuprofen like candy. We think that because they are sold over the counter there are no major issues if we take a relatively small dosage each day. Unfortunately, this isn’t true as NSAIDs wear down the stomach lining and reduce the ability of the stomach cells to produce HCL (3). 7) Using Proton Pump Inhibitors: These acid blocking medications reduce acid levels in the stomach which does give relief to those with acid reflux. Unfortunately, because acid reflux is typically caused from too little acid, taking these medications further reduces stomach acid, which leads to microbial overgrowth and further stress on the body (4). 8) Small Intestinal Bacterial Overgrowth: It is hard to say what comes first, is it the low stomach acid that allows for an elevated level of bacteria to enter into the digestive system alive and proliferate on undigested food particles (due to low HCL)? Or is that SIBO causes chronic stress in the body, which reduces the bodies ability to produce adequate HCL? Either way, there is a HUGE connection between SIBO and low stomach acid levels. 9) Aging: As we age in our society, all of systems slow down and especially the digestive physiology (5) This is even more the case if we are stressing our body more than we can adapt too. If you take care of your body at an early age and keep your digestion at an optimal level throughout life, you should be able to produce enough HCL in your later years. However, if you are over 50 years of age, it is wise to consider supplemental HCL as it may make a huge difference for you. 10) Food Sensitivities: Some of the most common food sensitivities cause major stress in the body, which puts us into chronic fight or flight. Be sure to stay off of the most common offenders such as gluten, corn, soy, peanuts and pasteurized dairy. If you notice other foods not agreeing with you, than look to avoid those as well. If you have a wide number of food sensitivities than it is a good bet you have low HCL. As you can see, there are many things that most people in Westernized countries are doing everyday that lead to the development of low stomach acid. Addressing low stomach acid should be one of the first places we look in order to improve digestive health, heal leaky gut and reduce overall stress on the body. Dr Jockers, thank you for sharing all this great information with us! I was looking for any information on LPR (laryngopharyngeal reflux), incl how to treat it, and can’t find any. Do you have experience dealing with it? Dr Jockers, this is very interesting because supplementing with HCL definitely helps with digestion, but on the other hand it causes more acid to back up into the esophagus, which causes the feeling of post-nasal drip and clearing the throat all the time. I thought clearing SIBO would help it, but it did not. I just have less bloating now. Checked for H-Pylori, came back negative. Do you think it maybe esophageal motility problem and prokinetic could help? Treating LPR is SO frustrating, even naturopath that I am seeing does not know what to do. Thank you for your help! Hi Dr Jockers – many thanks for some very indepth and informative articles. I am presenting with a range of symptoms that all fall into the no, or low, HCL category and am currently working with a functional medical practitioner in my town. Having started taking HCL (with pepsin) and digestive enzymes, I began by increasing HCL gradually, hoping for some sort of response. Now, at 26g per every large meal, I still have no heartburn and have experienced a total cessation of migraines (plagued for nearly 30 years with these). NO other symptoms have changed but I’m concerned about continuing at this level for fear of creating an ulcer (or similar). It’s also bloody expensive! Have you had experience with someone taking massive doses? Would you caution against this amount? Should I drop down the dose and just continue for longer? I thought Tylenol was okay to take while you have gastritis. It’s not a NSAIDs. It’s a Acetaminophen. I would not recommend Tylenol Tina. It is not an NSAID, but is still a chemical that puts unnecessary stress on the body without promoting health. It blocks pain but does not inhibit inflammation which is a concern. At the same time it puts an excess toxic load on the liver. To the person who is taking 26g with every large meal. I was headed in that direction and it isn’t good. An endoscopy showed I had developed bleeding stomach ulcers so knew I had to do something. A friend recommended just making chicken or turkey soup and eating the broth and vegetables, and some chicken. I almost used it like a cleanse. I mostly ate the soup, then tried a bigger meal here and there and I turned out to need hardly any HCL. It healed me for at least for now. Typically, I eat very healthily, but nuts and many things are hard ad maybe were too hard to digest especially if my stomach was in this poor condition. It must have damaged my stomach. This feels very healing. And less acid is hitting those open ulcers..
Dr. Jockers, I am a personal trainer and health coach and have been on the ketogenic diet for over 2 years. Just in the last 6 months I started noticing bloating and stomach noises within an hour after eating. The baking soda test confirmed that I definitely have low stomach acid. I did and organic acid test and had slightly elevated arabinose, and hippuric acid, but other than that no real issues to speak of. I can’t figure out what exactly is causing my low stomach acid and if it could be related to the high-fat diet. I started doing one green smoothie and one keto meal and although that has helped I still am dealing with bloating and gas sometimes after meals. Any advice you could give a fellow ketonian would be greatly appreciated. I frequently send your videos and articles to my client because they are such good information and will continue to do so. Thanks for reaching out, reading, and sharing Zach! You could try simply consuming 2-4 tablespoons of apple cider vinegar in a small glass of water 15 minutes before meals! If this does not seem to be helping then you may want to reach out to michael@drjockers.com for additional support and to discuss the utility of doing some health coaching specific to your needs. 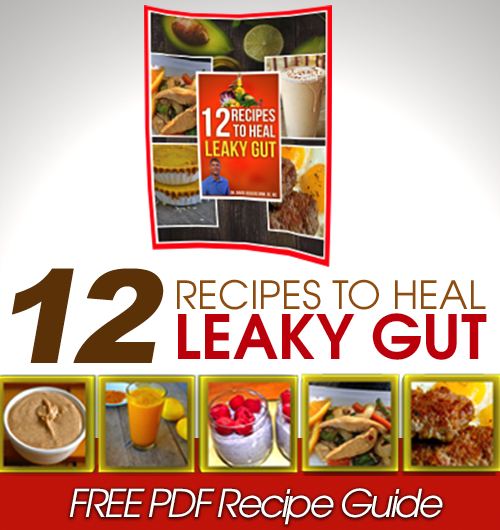 I am 20 years old with LPR and discovered I have low stomach acid. I was wondering, will i have to be on hcl for the rest of my life? In many cases it is only needed temporarily Luke! I had a case of arrithmyia in 2013 that sent me to the ER. The doctor didn’t find anything wrong and told me to see a cardiologist but I didn’t. It happened again 9-10-18 which was worse. Went to hospital and I was given Amiodarone IV and was better and I stayed all night to be monitored off Amiodarone. I had been taking Licorice supplement from my naturopath for several months for low thyroid. Supposedly it caused low potassium. On 11-5-18 I felt like it was happening again. I am now on Zarelto and waiting for a heart monitor. I am supposedly healthy from all test results. Could this be low stomach acid? I am 68. I know that you can’t diagnose me with this little information. I want to use natural means as I have done for many years. Hey Pam, it would be hard for me to tell without running some functional lab tests. If you want to dive into this, I would suggest reaching out to nutrition@drjockers.com for guidance. Hi Dr. Jocker I’ve been suffering from acid reflux for 2 years and a half its terrible.s Lately whenever I eat something I tend to get hoarseness and super bloated and food gets stuck in my esophagus. I am on ppis at the moment. I have been for ten months. My symptoms are of low stomach acid but they are of high stomach acid as well. I dunno what to do! Any advice will be very appreciated. thank you! !